ClubCoins Needed: 198 Please note that this item is not available on your device. You may add the item to your Wish list and redeem from a compatible device. This marketing classic has been expanded to include new commentary, new illustrations, and a bonus book: The 11 Immutable Laws of Internet BrandingSmart and accessible, The 22 Immutable Laws of Branding is the definitive text on branding, pairing anecdotes about some of the best brands in the world, like Rolex, Volvo, and Heineken, with the signature savvy of marketing gurus Al and Laura Ries. Com… bining The 22 Immutable Laws of Branding and The 11 Immutable Laws of Internet Branding, this book proclaims that the only way to stand out in todays marketplace is to build your product or service into a brandand provides the step-by-step instructions you need to do so.The 22 Immutable Laws of Branding also tackles one of the most challenging marketing problems today: branding on the Web. The Rieses divulge the controversial and counterintuitive strategies and secrets that both small and large companies have used to establish internet brands. 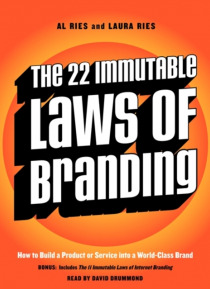 The 22 Immutable Laws of Branding is the essential primer on building a category-dominating, world-class brand.